Thanks to the 3DS Ambassador Program, I’ve been running through Minish Cap again. All things considered, it’s a solid Zelda game with plenty to do! 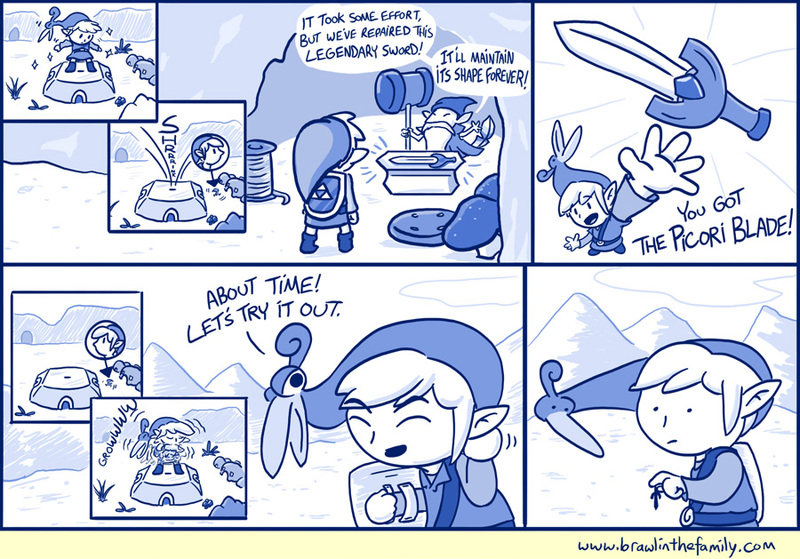 I was a little conflicted on this strip at first–I liked the end visual but it initially didn’t have the Minish blacksmith’s final line (“It’ll maintain its shape forever!”), and there was a contradiction within the game logic that didn’t completely sit well with me. So thanks for the suggestion, Chris! This is the last comic I’m updating from my current apartment! To save up a little bit, I’ll be briefly moving back in with the folks for the months before the wedding (June 15th! ), after which I’ll move once again into whatever new home Sarah and I are satisfied with (and can afford)! EDIT: Amidst the moving of furniture, clothes, and a ton of stuff, apparently the act of changing your home keeps you busy! Who knew? Sadly, between that and finally replacing my old 2004 computer (getting a new version of PhotoShop, buying cables so the tablet works with the new one, moving all my old data myself), I have to take this Tuesday off. But fear not, we’ll be back Friday with a fresh new comic for your enjoyment.